Designed by Mike Kolin, Mirko Micanovic, and Ali Hajighafouri. Illustrated by Kevin Myers. In a fictional Presidency more absurd than our own, ridiculous scandals threaten to embarrass the White House, and it’s up to you to positively spin the issues and sell scandal as success to the public. Shuffle the Scandal cards and stack them face-down where everyone can reach. 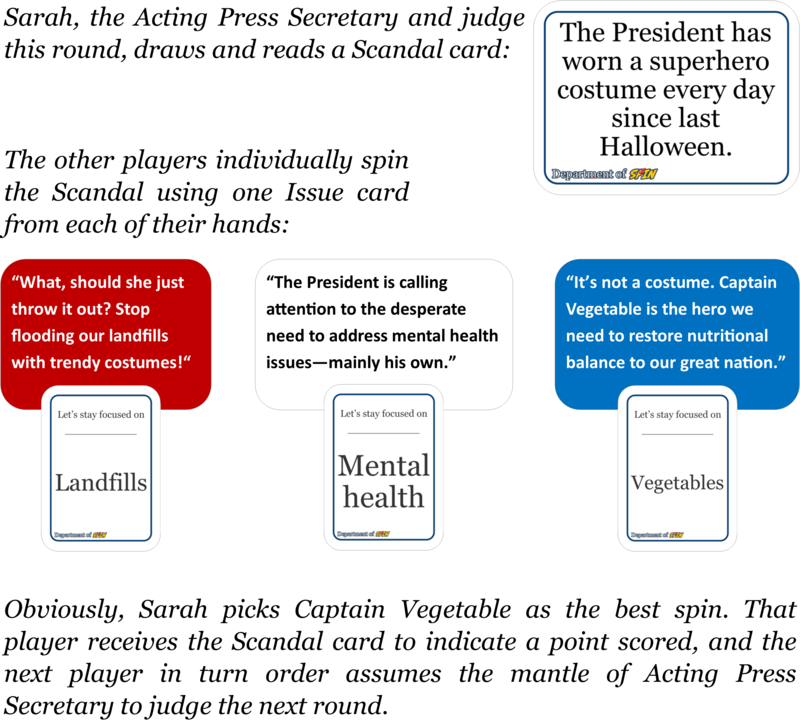 Note: Each Scandal card represents about 3 minutes of play time, so you can set a desired game length by limiting the number of Scandal cards with which you play. Shuffle the Issues cards and deal each player 5 for their hands. Stack the remaining Issue cards face down where everyone can reach. The player who most recently told a lie takes the first turn as the Acting Press Secretary and will judge the round. This player draws the top Scandal card and reads it to everyone. Spins can be funny, serious, factual, or utter BS–the judge decides which one is “best” based on his or her subjective opinion. 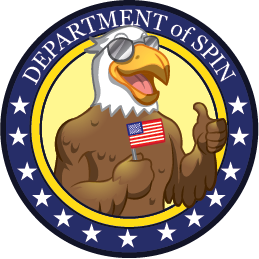 The player with the best spin receives the Scandal card, indicating a point scored. Used Issues, like used tissues, are discarded. Players draw back up to 5 Issues cards. After drawing up, players may also discard 1 unwanted Issue from their hands and draw a replacement. The next player in turn order (left of the judge) becomes the new judge, revealing the next Scandal and kicking off the next round of spins. The first player to score 3 points wins, but you can play to any score, number of rounds, or time limit you like.